Elle Fanning began her acting career by playing the younger version of her old sisters characters in both the mini series, ‘Taken’ and the movie, ‘I am Sam’ playing the younger version of her older sister’s character. In 2002, at the age of four, Fanning won her first role independent of her sister, in the comedy ‘Daddy Day Care’. In 2003, Fanning filmed ‘The Door In The Floor’ opposite Jeff Bridges and Kim Basinger . Anecdotal evidence of her young skill was seen in the decision to cast her in the role of Ruth in ‘The Door in the Floor’. The film’s producers had originally planned to hire identical twins for the intense shooting schedule, but were so impressed with Fanning that they used only her. Late in 2003, Fanning filmed ‘Because of Winn Dixie’ in the small role of Sweetie Pie Thomas. Late in 2004, Fanning filmed ‘I wat someone to eat cheese with’. 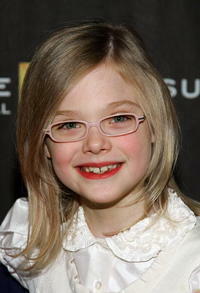 In early 2005, Fanning filmed scenes in ‘Charlottes Web’ as the “future granddaughter” of Fern Arable played by Dakota. These scenes did not make the final cut, however. In mid 2005, Fanning played Debbie, the daughter of Brad Pitt and Cate Blanchett in the academy-award nominated film Babel. In early 2006 Fanning filmed scenes in both The Nines and Deja Vu. In mid 2006 she filmed The Lost Room a sci-fi TV mini-series. By the end of 2006, Fanning began to book lead roles. Her first being in Reservation Road playing Emma Learner, the grieving daughter of Joaquin Phoenix and Jennifer Connelly. The film deals with the aftermath of a tragic car accident in which Emma’s brother is killed. Early in 2007, she had a small part in The Curious Case of Benjamin Button as a younger version of Cate Blanchett‘s character (as opposed to Babel where Fanning played her daughter). Mid-year 2007 Fanning filmed Phoebe in Wonderland as the title role Phoebe. It is the fantastical tale of a little girl who won’t – or can’t – follow the rules. It also stars Felicity Huffman and is expected to be released in 2009. From July to October 2007, Fanning filmed The Nutcracker – The Untold Story playing Mary. Set in 1920’s Vienna, this is a tale of a little girl whose godfather gives her a special doll one Christmas Eve. Fanning filmed this movie in Budapest, Hungary. It is expected to be released late 2008. In March 2008, Elle Fanning and her sister Dakota Fanning, were scheduled to star in My Sister’s Keeper, but the opprotunity fell through when Dakota learned she would have to shave her head. They were immediately replaced by Abigail Breslin and Sofia Vassilieva.